The biggest hair problem I face isn’t frizziness or brittle, dry strands – nope! Instead, I face the challenge of having hair that takes a really long time to dry. Even hair stylists will tell me time and time again, “Wow, your hair really holds in water!” Nine times out of 10 I get so impatient that I’ll just leave a salon with a half-wet head. Since I love wearing my hair straight (it’s naturally wavy), I was intrigued by Remington’s Wet 2 Straight Flat Iron With Soy Hydra Complex ($27.99, Remingtonproducts.com), a tool that promises to dry and smooth in one step. 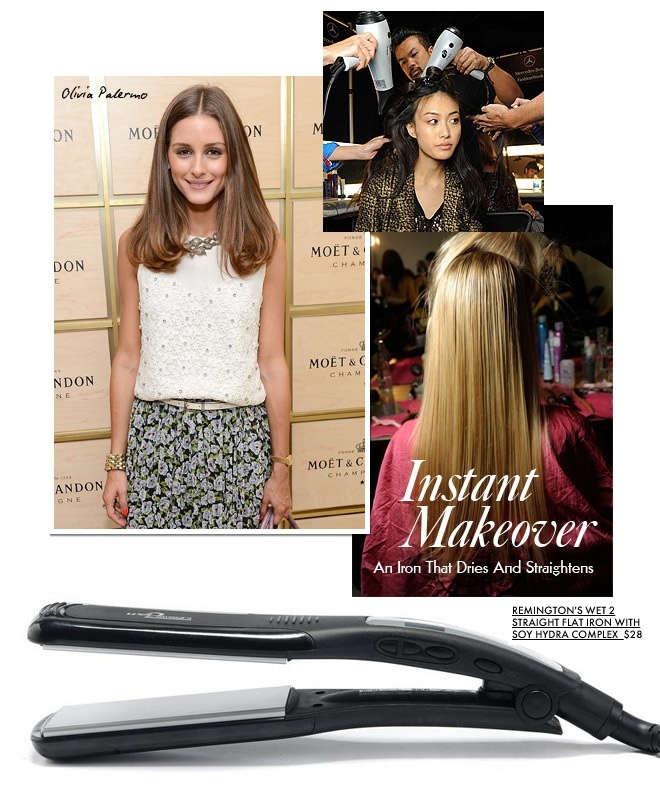 The iron has vents on one side that release steam as you pass it over your strands, which helps to dry the hair. And since it’s heated, the plates also work to straighten hair. Using it for the first time is a little scary. The iron makes that awful sizzle sound when it touches your wet locks, which makes you feel like you’re ruining your hair, but you’re not. You can see the steam coming out of the iron, so you know it’s sucking the water from your hair. An important lesson I learned: Always make sure the iron is turned so the vents point away from you. I once forgot, and all of that burning hot steam landed on my neck. Needless to say, it burned the bejeezus out of me. I’ve used the Wet 2 Straight iron twice now, and I’ve been happy with the results both times. It leaves my hair looking silky and surprisingly healthy, which it never does after I torch it with a blow dryer. As someone who values their time, I like the fact that I can straighten my hair right out of the shower without having to wait for it to dry. What hair dilemma do you want to solve?